This first installment of the Cliff Weller mystery series opens with a down-on-his-luck Cliff drinking his blues away at Nicky Congo's bar. But the gearshift of his luck slams into fast forward when a baffling but attractive woman seeks his help in locating a runaway teenager. Maybe it was the wad of cash she flashed or the scent of her perfume-either way, against his better judgment, Cliff was compelled to take on the case. But, of course, not all is as it seems. Through his investigation, Cliff uncovers the Geminus Corporation, a sinister organization involved in clandestine genetic experiments. He also discovers that the corporation, the woman, the runaway, and a homeless man (who seems to have returned from the dead) have a shadowy connection. Then there's that abandoned warehouse on the edge of the city, the one with the eerie, inexplicable lights. Is it really haunted, as the locals say, or is something else going on there? 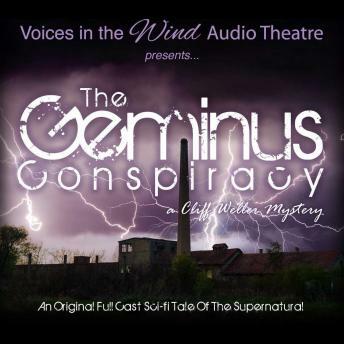 This supernatural sci-fi tale features British voice actor David Ault as Cliff Weller, a full cast, engaging sound effects, and music.